Freshwater wetlands have become scarce in Seychelles, and those that survive face a variety of threats including development, pollution and invasive species. So when BirdLife Partner Nature Seychelles was offered the lease of a small wetland in the Seychelles capital of Victoria, on the island of Mahe, they saw an opportunity to combine conservation of vanishing wetland biodiversity with an environmental education centre, on the very doorstep of more than a quarter of the Seychelles’ population. Freshwater wetlands and its biodiversity face a multitude of threats, from overexploitation, eutrophication, water regulation, climate change and the introduction of invasive alien species (Brinson and Malvárez 2002, Dudgeon et al. 2006). Freshwater wetlands in the Seychelles face these pressures, making action by BirdLife Partner Nature Seychelles necessary for their conservation. 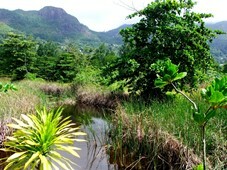 Nature Seychelles was offered the lease of a small wetland in the Seychelles capital of Victoria enabling them to combine wetland conservation with environmental education. The wetland, known as Roche Caiman after the surrounding area of the city, had been run as an informal bird sanctuary since the 1980s, but was threatened by urban expansion. The Government of Seychelles, which owns the site, was willing for it to be taken over and managed by Nature Seychelles, the country’s leading conservation NGO, but money was needed to pay for the lease, and to manage the wetland as an urban wildlife reserve and visitor centre. With funding from the Aage V. Jensen Charity Foundation, Nature Seychelles has restored the wetland and surrounding habitats, digging ditches and installing sluices to maintain the water level, and replacing introduced trees and plants with native species. They have enlarged the area of open water, and created nesting habitats for waterbirds. A boardwalk (made from recycled drinks bottles) now runs around the reserve, with viewing platforms and interpretative signboards. The grant from the AVJCF has also enabled Nature Seychelles to build and equip a small visitor centre. In addition to casual visitors, hundreds of adults and schoolchildren attend educational programmes and other events at the Roche Caiman Sanctuary each month. Under the Seychelles Green Health Programme, the Sanctuary provides courses which promote wellbeing in surroundings dedicated to the protection and appreciation of the natural world. “Until recently this wetland was regarded as just a hole in the ground”, said Nirmal Jivan Shah, Chief Executive of Nature Seychelles. “The Aage V. Jensen Charity Foundation funds came in the nick of time. Their generous support has provided the catalyst to develop the Sanctuary at Roche Caiman into an exciting focus for urban renewal, mixing ecosystem restoration with awareness and education, and conservation with community action”.